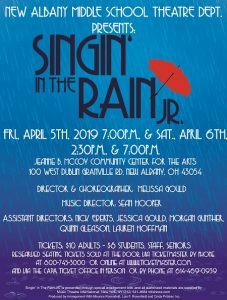 New Albany Middle School Theatre Department presents: Singin' in the Rain Jr. Friday, April 5 | 7:00 PM Saturday, April 6 | 2:30 PM & 7:00 PM McCoy Center The "Greatest Movie Musical of All Time", Singin' in the Rain Jr. has hilarious situations, snappy dialogue and a hit-parade score of Hollywood standards making it a guaranteed good time for performers and audience members alike. Singin' in the Rain Jr. has all the makings of a Tinseltown tabloid headline – the starlet, the leading man and a romance that could change lives and make or break careers! In silent movies, Don Lockwood and Lina Lamont are the couple of the moment, but in Hollywood not all is as it seems. Despite an “on-screen romance” fueled by the Hollywood Press, behind the scenes, things aren't always as they appear on the big screen! And sometimes the stars even believe the media hype. Meanwhile, Lina's squeaky voice might be the end of her career as Hollywood embarks down a new road with the introduction of "talking pictures". Without the help of a talented young actress to do the talking and singing for Lina - her career could be ruined. Featuring a cast and crew of more than 65 New Albany 6th through 8th graders, you’ll be humming a tune on your way home from the show!